Since launching in 2003 from a small recording booth in New York City’s Grand Central Terminal, StoryCorps has created both the largest single collection of human voices ever gathered and one of the most diverse staffs in mainstream public media. Both achievements resulted from intense effort, long-term planning and a persistent commitment to reflect the nation both in front of the microphone and behind it. The journey was anything but simple, said Dave Isay, founder and president of the trailblazing oral history project. “Nothing good comes easy,” he said. Isay’s vision for StoryCorps was to tap into the essential humanity of people from all walks of life, empower them to reflect on their life experiences through storytelling and preserve their voices as a record of our times. The act of creating content, not creating an audience, was the point, which may explain StoryCorps’ raw appeal. “It’s the anti-reality TV,” Isay said. Now, as interest in its content swells, StoryCorps is expanding beyond weekly segments on NPR’s Morning Edition. Its audio interviews and animated shorts are increasingly integrated in the websites and social media networks of StoryCorps and its partners. The StoryCorps app unveiled last year lets anyone anywhere record interviews on a mobile device. And StoryCorps hopes to announce a new licensing agreement this month that will significantly enhance its animated videos. From its early days, StoryCorps benefited from its close relationship with NPR, which presented its audio segments on Morning Edition, its most popular newsmagazine. But the enthusiastic response from public radio listeners, a predominantly white and affluent audience, had its drawbacks: They snapped up available time slots at StoryCorps’ booths. Meanwhile minorities and others whose voices are underrepresented in the media had never heard of StoryCorps and its efforts to collect oral histories. In 2007 the Brooklyn-based nonprofit took the first in a series of steps to broaden participation: It began reserving half of all recording slots in its booths for diverse participants. It also set goals for including underrepresented communities in its productions, and developed extensive outreach and community engagement programs to find them. In 2009 it mandated that the demographics of its interview participants mirror that of the U.S. Census. Like other media companies, StoryCorps has struggled internally with the challenges of achieving staff diversity. But by developing strategies for recruiting and interviewing diverse candidates, and providing opportunities for staff to move up through the ranks, senior management created what they describe as a virtuous cycle for recruiting and retaining a diverse workforce. Currently, of StoryCorps’ 88 regular full- and part-time employees, 48 percent identify as non-white or LGBTQ — that’s 58 percent of support staff and 28 percent of senior managers. Over 27 percent are bilingual. “When you become known as a place that is comfortable for diverse folks, the word gets out. People of color who are radio producers like to work at a place where people of color are important,” said Donna Galeno, chief programing officer, who is credited as a driving force behind StoryCorps’ diversity initiatives. She joined the nonprofit in 2003 and is stepping down this month. Megan Thiele, head of human resources, has been with StoryCorps since 2008, a year after the company began setting goals for diversity among interview participants. “When I was hired, it was pretty clear in the job description that recruiting and retaining a diverse staff … was an institutional imperative,” she said. At that time, the organization had just hired a team of African-American staffers for Griot, a 2007 initiative targeted to black communities. Yet the staff was 75 percent white, with only two top managers of color, she said. Initiatives that followed, such as Historias, collecting Latin American voices, often began with dedicated funding for multilingual staff devoted to performing outreach in specific communities. Those connections between diversity in staffing and audience service became inextricably linked at StoryCorps. Beginning in 2010 management decided to broaden the effort, moving beyond the targeted initiatives to incorporate diversity into ongoing content and staffing strategies. Top managers developed a plan for achieving staff diversity across departments. Since its humble beginnings, with five employees and $250,000 in funding, the organization now operates on a budget of $11 million and a total workforce, including interns and per diem employees, of 155. As it grew, StoryCorps managers set precise targets for diversity in content, but they never did so for staff. Instead, they made diversity an organizational priority and developed practices to make it happen. “We don’t have a number, that you should hire X. That’s not how you do it,” Galeno said. StoryCorps structured its recruitment processes carefully, posting openings on job sites that reach diverse communities, including the New York Black Librarians’ Caucus, National Association of Black Journalists, Latino Public Radio Consortium and National Black Programming Consortium. It also fostered close ties with nearby universities like Brooklyn College and the local campus of Long Island University. Facilitators, the entry-level employees who oversee recording in the booths, make up the biggest category of StoryCorps staff. Some work part time or on a per diem basis. Their training is intensive and offers opportunities to move up through the ranks. 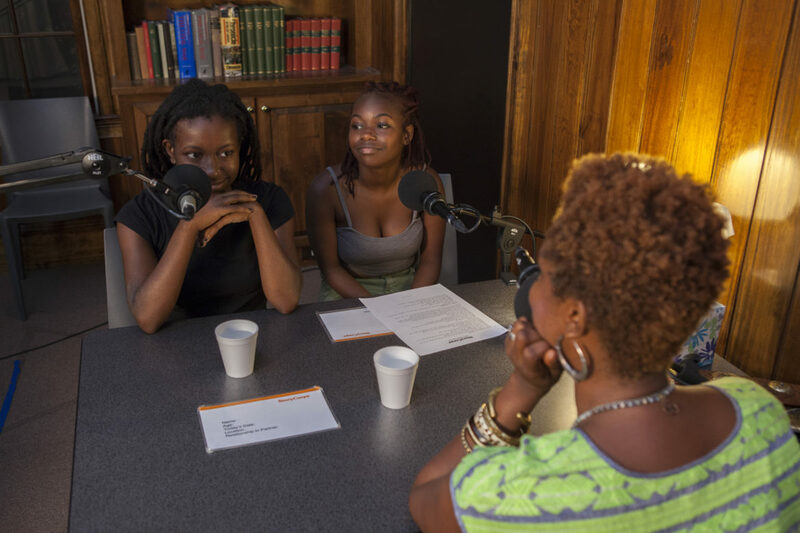 StoryCorps screens applicants for their ability to work with people from different backgrounds and seeks candidates with broad qualifications and varied experience. “We are a nontraditional part of public media. We do a lot more than producing radio,” Thiele said. Prestigious outside organizations have recognized StoryCorps with plaudits and funding. A MacArthur Award for Creative & Effective Institutions, presented in 2013, came with a $1 million prize. Last year a TED Prize provided $1 million to support development of the new app. Some 5,000 interviews are recorded each year, bringing two or three people who care about each other together in a booth for 40 minutes. Participants can be family members, spouses, teachers, colleagues, friends or neighbors. Their conversations are captured in listening booths in Chicago, San Francisco and Atlanta. Its mobile studio — an Airstream trailer outfitted for sound recording — also travels to 10 cities a year. The mobile studio tours play an important role in bringing new voices to StoryCorps national productions. Tour locations are scouted and selected a year in advance, according to Dina Zempsky, managing director of the StoryBooth department, based on criteria designed to include diverse communities. Facilitators usually take a day or two of each tour to fan out into schools, churches and libraries to find people who are harder to reach. Recorded interviews are preserved at the American Folklife Center in the Library of Congress and in any local archives that want them. A minuscule number of interviews — about 0.04 percent of the total — are edited down to under four minutes and featured on NPR’s Morning Edition every Friday. Some are of these produced as animated shorts for StoryCorps website and presented on POV, a PBS showcase for independent film. Felix Lopez, a former teacher and intern in StoryCorps’ animation department who is working a one-year stint as bilingual facilitator for the mobile booth, described the recording process as an intimate, immersive experience. “Forty minutes seems long, but I am always having to tell people, ‘We have five minutes left,” said Lopez, during a break at StoryCorps’ recent staff retreat. Participants always end their interview sessions with “this marvelous joy on their faces” because they’ve released pent-up emotions. Lopez said he’s particularly moved by interviews with children, like one he recently recorded between a six-year-old boy and his father. The exchanges can be so heartfelt that the facilitators always have a box of Kleenex on hand. Stories resonate on a poignant, personal level — a mother interviewed by her 12-year-old son with Asperger’s Syndrome or a woman talking with the man who murdered her son — but they can also capture themes of national significance, such as the experiences of Muslim-Americans. Thanks to StoryCorps’ ongoing outreach to Muslim communities, 21-year-old Yusor Abu-Salha recorded an interview several months before she was shot and killed, along with her husband and sister, in a racially motivated attack last year in Chapel Hill, N.C. The deep archive of interviews and determined efforts to record personal stories not heard on mainstream media also allow producers to illuminate how the past is reflected in news of the day. For example, after the last month’s mass shooting in the Pulse nightclub in Orlando, StoryCorps aired a wrenching interview recorded several years ago with Reverend Troy Perry describing the aftermath of an arson fire in a gay bar in New Orleans in 1973. Before the Orlando shootings, that had been the deadliest LGBTQ attack in the U.S. The NPR broadcasts have gained StoryCorps a passionate following, turning nonprofit into a media sensation even as producers have struggled to reach beyond the demographics of public radio’s core audience. “My love for public media is profound, but it’s not the most diverse group,” Isay said. He likes to think of StoryCorps as “the on-the-ground personification of diverse values in public broadcasting,” he said, even if actual diversity in public media still has a way to go. And StoryCorps’ own journey is far from over, he said. A report offers recommendations for journalists looking to produce comprehensive and inclusive coverage of racial issues.